I can’t think of anything more appropriate for an Easter Sunday that is also April Fools Day than Jesus Christ Superstar. There is something so deliciously subversive about sending a sacrilegious musical about a human man with a PR problem out to the American heartland via wholesome NBC on the holiest holiday in the Christian year. I’m obsessed with the notion that at least some of the viewers of last night’s epic Andrew Lloyd Webber extravaganza watched without noticing that Tim Rice’s lyrics have absolutely no mention of Jesus actually being divine (there’s a directorial misstep at the end of this broadcast that suggests somebody maybe missed the point but I’m choosing to ignore it because that’s what I do with stupid things). Jesus Christ Superstar is a brilliant deconstruction of messianic myth and our modern fame complex; it is not a religious story. It’s a story about a man who meant well and let things get out of hand, and another man who meant well who tried to right wrongs by doing the wrong thing. Judas is its tragic hero. Godspell it is not. But folks across America were tricked into watching it as the capper to their Easter supper, making it the only April Fools joke I’ve ever actually enjoyed. The first thing that went right with this NBC live musical was that they billed it as “Live in Concert”. To be clear, it was not live in concert. It was a fully staged musical; perhaps a bit condensed but fully staged nonetheless. But NBC’s musicals have generally stunk and one of the main reasons is that they attempt to cram everything into these really cheap-looking sound stage sets as if they were making a live movie. The “Live in Concert” label, inaccurate though it was, gave co-directors David Leveaux and Alex Rudzinski the freedom to stage the show like a piece of theatre. The best TV live musical to date was FOX’s Grease and one of its main innovations was embracing theatricality like quick changes and audience members. JCS took that a step further and basically just filmed a one-night-only stage production. It’s simpler, it looks better; let’s do this all the time. Once a month on a Sunday night, let’s just air a Broadway musical on NBC and see if we can change the world by exposing people to musical theatre. That’s definitely not the worst plan you’ve ever heard. The second thing that went right is the casting. It went close to perfectly right and that’s a really huge deal. It’s not great that the one flaw was Jesus but, proportionally speaking, they still came out on top. 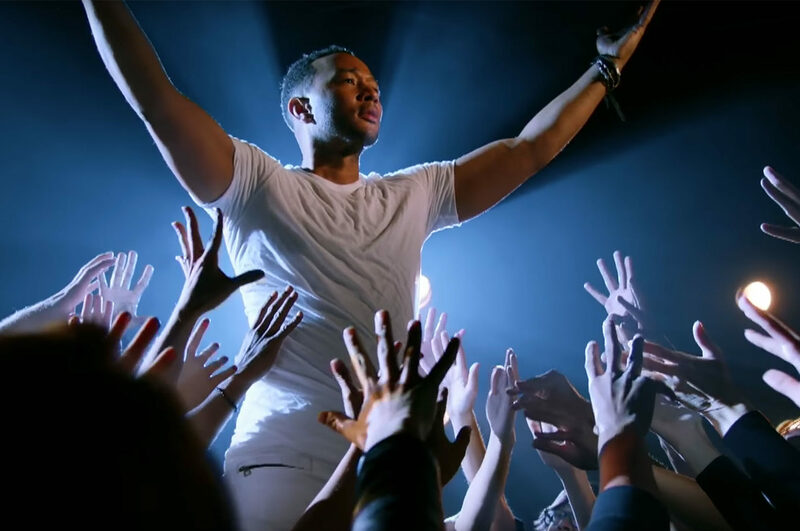 The idea of John Legend in this role was magical- a superstar celebrity known for his charisma is the sort of thematically insightful choice that made me really trust these directors. But JCS is hard. Like, really hard. Like, most trained musical theatre singers can’t even sing it hard. And it was simply beyond Legend’s abilities. He may have been the best thing about La La Land (don’t @ me) but his acting chops are not stellar (why are you moving your head so much? Stand still!) and the default into falsetto for every single hard high note was just depressing. At first I thought the head voice might be an interesting character point and a useful differentiation from Judas’ vocals but the score just doesn’t support that as a full-show choice so it quickly just became a “he’s not up to this” beacon. Everyone else was great, though. It’s usually Judas’ show so it was strange to see Brandon Dixon (of Hamilton Pence speech fame) get a little lost in the shuffle- the love triangle was all but totally deleted and his death was anti-climactic in a “maybe something went wrong, it’s live TV” way- but those things weren’t his fault; his performance was pretty dead-on. Sara Bareilles absolutely nailed both the deceptively difficult vocals and the explicitly difficult emotional arc of Mary Magdalene and Alice Cooper was an against-type hoot as Herod, the two of them redeeming the production’s stunt casting record as best they could in the shadow of Legend’s letdown. But it was the places where the casting team resisted the urge for mainstream stars that the production really earned its cred. The legendary Norm Lewis was legendary as Caiaphas, a perfect testament to the best too-often-broken rule of screen musicals- “cast a real goddamn singer!”. Jason Tam and Erik Grönwall were excellent featured apostles (Peter and Simon respectively), leading an ensemble that was wall to wall fire. Ben Daniels gave the acting performance of the night in what I consider the musical’s trickiest role- Pontius Pilate. His final notes were more than rough but he was so compellingly conflicted that I chose to forgive him (there’s a Jesus joke in there somewhere, find it on your own time). My personal favourite performance of the evening came from Jin Ha whose manipulative and beautifully sung Annas gave me those “who’s that? !” feels that I love so much. As previously mentioned, the ending involves some serious directorial face-planting (and way too much of Legend’s bad acting) but Jesus Christ Superstar was NBC’s best live musical attempt by a pretty wide margin (Hairspray was fun on account of being Hairspray but the others were brutal). Not only were the ensemble work enthralling and the supporting performances awesome but Jesus Christ Superstar is just a good, hard, relevant musical and that’s not something most of the other live musicals have been. It’s such a rich, complicated art form but to date the TV networks have been scared of the really good stuff. Jesus Christ Superstar raised the bar. Hopefully this “live concert” concept will catch on and the networks will realize that they don’t have to build elaborate sets and hire hundreds of extras. Just hand great musical theatre material to the right artists and send the magic into the living rooms of people who don’t get enough theatre. Dress it up as holiday content, call it April Fools if you have to, but get it where it needs to go cause we need more of this.